Curiosity Mars rover sees no organics in Mars sample. Scoop marks where the Mars Curiosity rover tooks samples of the red planet’s surface. Click to enaresenate. For a while, the planet (Earth) was abuzz with speculation about something found on Mars that was “for the history books.” As we now know (and I warned you, folks), this was nothing more than speculation: A reporter ran away with a quote by a Curiosity scientist who simply meant that the overall mission would make its mark on planetary science history. At the time, when rumors were flying, some people were thinking “organic molecules.” These are complex molecules based on carbon, which are the basic building blocks of life as we know it. We also know there’s frozen water all over Mars—another necessary ingredient for life—so they idea of finding organic compounds is exciting. At a press conference today, scientists talked about the latest results from Curiosity, and they put the kibosh—temporarily, at least—on organics. “We have no definitive detection of Martian organics at this point, but we will keep looking in the diverse environments of Gale Crater,” said Curiosity scientist Paul Mahaffy. He is the Principal Investigator (top banana) on the SAM (Sample Analysis at Mars) instrument, a device that can perform detailed analysis of the chemistry and composition of surface samples scooped up by the rover. This result isn’t terribly surprising, actually. The Mars Phoenix Lander set foot near the red planet’s north pole a few years ago and found a high level of perchlorates, a reactive chemical that can destroy carbon-based compounds. That was a long way from where Curiosity touched down, but it did show us that organic molecules may be in trouble on Mars. 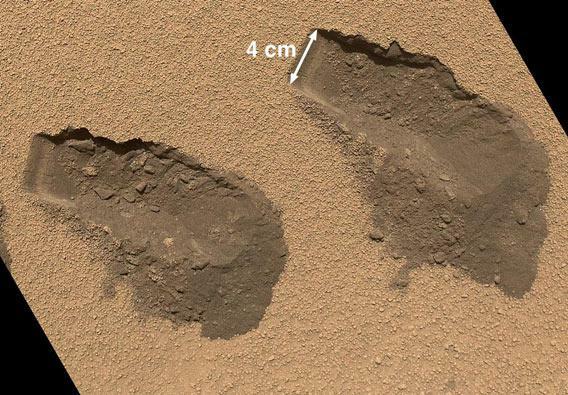 And Curiosity found evidence of perchlorates at its location as well. That’s too bad, but not devastating. For one thing, the chemistry of the surface changes with depth, and we have literally only scratched the surface. And we’ve still only examined a tiny, tiny fraction of Mars. There’s a lot of real estate yet to explore. 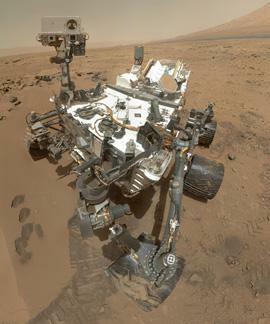 Curiosity’s self-portrait. Click to johnny5enate. I’ll note that a very small signal from what may be simple organic molecules was found, but it could be something left over from Earth still inside the rover. That’s why in the quote above Mahaffy said, “no definitive detection.” We can be sure organics aren’t abundant on Mars in this area, but time will tell. Still, what Curiosity did find was pretty interesting. Chlorine, sulfur (together comprising up to 10 percent of the samples taken), even some water molecules (not much—we’re not talking ponds or snowfields, just some molecules—but more than expected). It also is seeing glassy compounds and other minerals typical of volcanic emissions. The good news I’m seeing here is that Curiosity works, and works great. I know some people will be disappointed with the news of what it found, but cripes: We have a one-ton nuclear powered mobile chemistry lab roving around an ancient riverbed of another planet! That very fact gives me chills. Oh, the things we humans do.